During the latter stages of the American Civil War, the H.L. Hunley made history by becoming the first combat submarine to sink an enemy ship. The Confederate crew never returned from its mission, sparking a mystery that’s lasted for over 130 years. An exhaustive new analysis suggests these pioneering submariners didn’t drown or suffocate as commonly believed, but instead died from the shockwave triggered by their very own weapon. The eight-man crew of the 40-foot Confederate submarine H.L. Hunley died instantly when its powerful barrel torpedo exploded into the hull of the 1,200-ton Union warship USS Housatonic, according to new research published today in PLoS One. Duke University biomechanist Rachel Lance’s exhaustive, three-year investigation suggests the explosion caused minimal damage to the sub, which was less than 20 feet away, but the ensuing shockwave caused catastrophic injuries to the crewmen’s soft tissues, especially to their brains and lungs. The finding subsequently fills in an important gap in US Civil War history, while offering fresh insights into human physiology and the physical forces we’re able—or unable—to endure. On the evening of February 17, 1864, the H.L. Hunley, commanded by Charles Pickering, embarked on what would be its first and final combat mission. 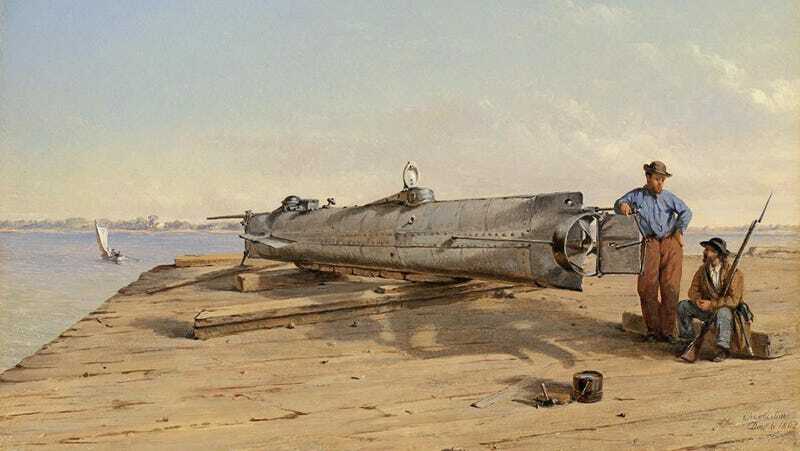 As part of the Confederate campaign to dismantle the stifling Unionist naval blockade, the sub’s crew managed to sink the USS Housatonic with a submersible barrel bomb. This “torpedo” wasn’t a self-propelled bomb in the conventional sense. Rather, it was a copper keg filled with 135 pounds of black powder that was positioned slightly ahead and below the sub’s bow at the tip of a 16-foot pole known as a spar. The crew plunged this bomb into the Housatonic’s hull just below the waterline, causing a tremendous explosion. The Union warship sunk in just five minutes, killing five of her crew. The ship came to rest upright in 30 feet of water, allowing the remaining seamen to be rescued. The mission may have been a success, but the crew of H.L. Hunley was never heard from again. Its fate was finally revealed in 1995 when the sunken sub was found a mere 300 meters from the wreck of the Housatonic near Charleston Harbor in South Carolina. The sub was raised in 2000, and it has been under investigation by Clemson University scientists ever since. But while the sub’s fate was finally revealed, it still wasn’t clear what transpired during the military engagement, and what led to the death of its eight seamen. Historians have speculated that the Hunley crew drowned or suffocated, or that shear forces broke a valve causing the sub to sink—or even that the H.L. Hunley was shot by a seaman aboard the doomed Housatonic. But none of these explanations fit the evidence. Confusingly, the crewmen’s skeletons were all found at their hand-crank stations, which were used to manually propel the craft. They exhibited no broken bones, the drain pumps were closed, as were the air hatches. The sub was startlingly intact, the only noticeable blemishes being a hole in one conning tower and an apparently broken window. The only satisfactory explanation, argues Lance, is that the crew was killed instantly by the shockwave generated from the barrel bomb explosion. To prove her case, Lance constructed a 6-1/2-foot scale model of the sub and subjected it to pressurized air blasts and black powder explosions while monitoring the effects with a series of onboard sensors. With the help of a Civil War reenactor and his fully functional, historically accurate rifle, she shot at period-accurate iron plating meant to mimic the sub’s hull. She analyzed the effects of energy blasts onto the human respiratory system, pored through documents at the National Archives in Washington, interviewed an ATF explosives expert, and even visited an original black powder mill. The whole endeavour took about three years, but the results are compelling. Lance’s conclusion is that all crew members died instantly from the tremendous force of the explosion. The ensuing shockwave travelled through the soft tissues of seamen’s bodies, especially their lungs and brains. Normally, a shockwave of this strength would travel at a rate of 340 meters per second (m/s) through the open air, but underwater it accelerates to 1,500 m/s. By the time this shockwave hit the sub and penetrated the crewmen’s skin (the distance to the explosion varied for each crew member, ranging from 18 to 42 feet depending on where they were positioned in the sub), it slowed down to 30 m/s, which was still enough to cause catastrophic physical damage. Each seaman was subjected to about 60 milliseconds of shockwave trauma, as compared to about 10 milliseconds had the men been exposed above water. Lance assesses the probably of this happening to each crew member at about 85 percent. This cause of death would have left no mark on the skeletal remains. The soft tissues, which would have shown what happened, are long gone. But in addition to this shockwave analysis, other evidence exists to show that the men died instantly. Had they survived the blast, the crewmembers would’ve tried to release the keel ballast weights, start pumping water, or make an effort to escape the sub—but it appears none of these actions were taken. Lance says these findings hold dual significance. For Lance, the other important aspect of this work was finally being able to solve an enduring maritime mystery.